Ah, balmy Kamio. It was the second system ever to be annexed into New Order territory. 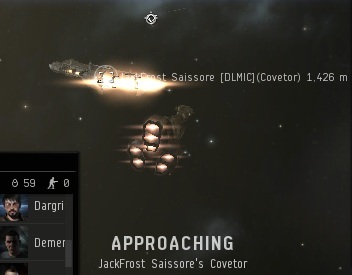 For some reason, miners come and go throughout highsec, always looking for a better deal. This means that no matter how long a system remains in the warm embrace of the New Order, there will always be a refreshing flow of new friends for us to make. Suddenly things got chilly in Kamio. 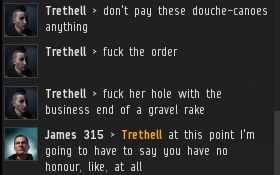 Out of nowhere, a miner named Trethell left the asteroid belt, docked up, and raged at me from within the station. I didn't know him, but he acted like we were archenemies or something. 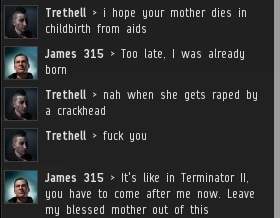 I don't understand why so many miners toss around insults about my mother. Just imagine how awesome a woman would need to be, to give birth to me. I'm a notoriously good judge of character. 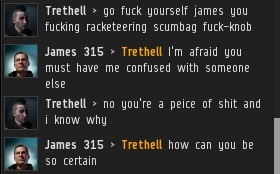 After only a few minutes of chatting with Trethell, I began to form an opinion about him. Trethell bristled at the suggestion that he lacked honour. It was as I suspected: He had been brainwashed by the carebearists and bot-aspirants. Meanwhile, I assisted some other future paying clients. JackFrost Saissore was at his keyboard, but was tragically short one mining permit. Trethell discouraged JackFrost from paying. Like a disease, hatred and ignorance can spread from person to person. 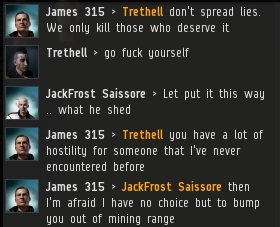 Despite my smooth conversation-starters and professional demeanor, Trethell successfully poisoned JackFrost against me. JackFrost might've been well on his way to Code-compliant bliss if not for the interference. 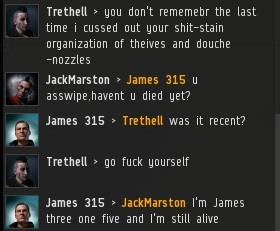 I wanted to get to the bottom of the Trethell problem. I didn't recognize him, but perhaps he was still reeling from a previous encounter with one of my Agents. 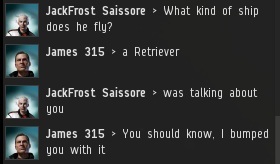 Sure enough, Trethell had lost a Retriever back in June, to a suicide ganker named Saltire. 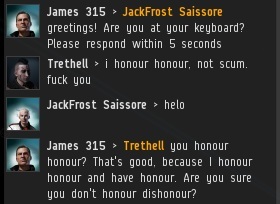 I don't know if Saltire was acting in the name of the Code, but Trethell was acting like it. On the other hand, he'd moved all the way from the Metropolis region to get to Kamio. I noticed that Trethell had an interesting fit: It's not every day you see a Retriever with 200mm Reinforced Nanofiber Plates. Or for that matter, any ship with those plates. 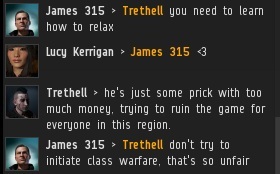 It's a shame that people like Trethell try to pit the rich and poor against each other. We're all in this thing together. The New Order does not discriminate based on socioeconomic status; every miner owes the same 10 million isk, no matter what. Despite being chased out of a distant region, Trethell insisted that the reach of the gankers was short. But I was more concerned about the disturbing thoughts that JackFrost was starting to voice. I knew what to expect when I saw that familiar glint in JackFrost's eyes. I'd seen it before. It was the look of treason. "You should now, I bumped you with it"
On the 200mm plates: They're common on brawly frigates, like the Comet. Retrievers have poor cpu and powergrid, and cannot really fit cruiser-sized plates. 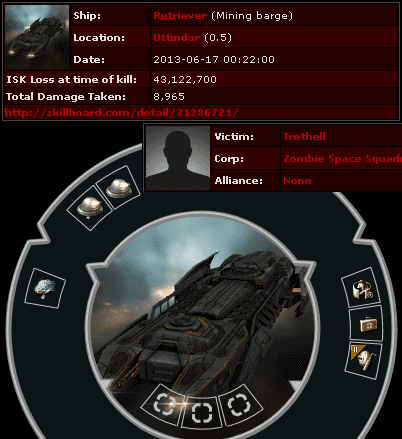 The damage control 1, armor rep, and lack of rigs leave a lot to be desired, but I would not be surprised to see this on a sub-5 million sp character. However, he is a character from '08 so it's actually just embarrassing. But I can forgive any factual errors, if only because of that godmode pun in the title. Good to know we are all treated fairly under the Code, we have the same rights, and the same responsibilities. 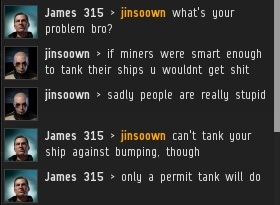 I know guys in the military who would blush at the way miners talk in Eve. bad language like that. Then use it to set up a training program on how carebears should tank a mining vessel. 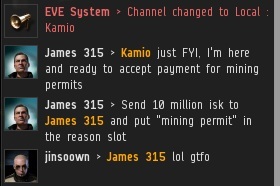 In return they pay the 10 mill isk to james and the NO, to mine within the code. I don't know whether to laugh or say "yikes" to your comment Lenda Shinhwa. It doesn't get any classier than George Carlin. 1. 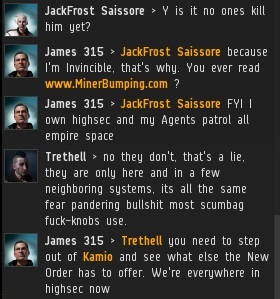 Jack grabs Talos and tries it on James. 2. Jack finds The Invincible Stabber™ more invincible than expected. The carebear gets transformed in what he hates the most, a suicide ganker. And a failing one to add insult to injury.